Sloppy Joes is a family favorite of ours. When I saw this recipe I couldn't wait to try it. 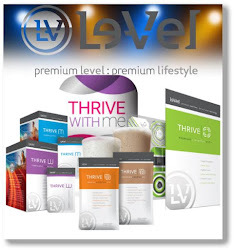 It is flavorful twist to an already tasty recipe. 1. In a large skillet heat the extra virgin olive oil over medium high heat. 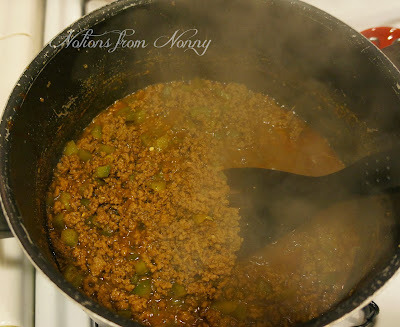 Add the ground beef and brown while breaking up in chunks with a spatula or spoon. 2. Add the chopped green pepper and onion cooking for about 3-4 minutes until they start to become tender. Drain all excess liquid. 3. Add the beef broth and steak sauce and bring the mixture to a boil. Continue cooking until sauce is thick and bubbly. 3. While this is cooking, Split the hamburger buns and butter each side. 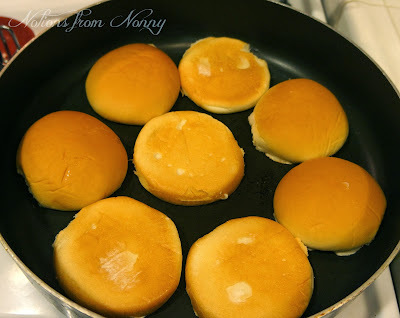 Place the buns side down onto a separate skillet until golden brown. 4. To make the cheese topping, melt the butter in the skillet and add the flour. Cook for one minute. 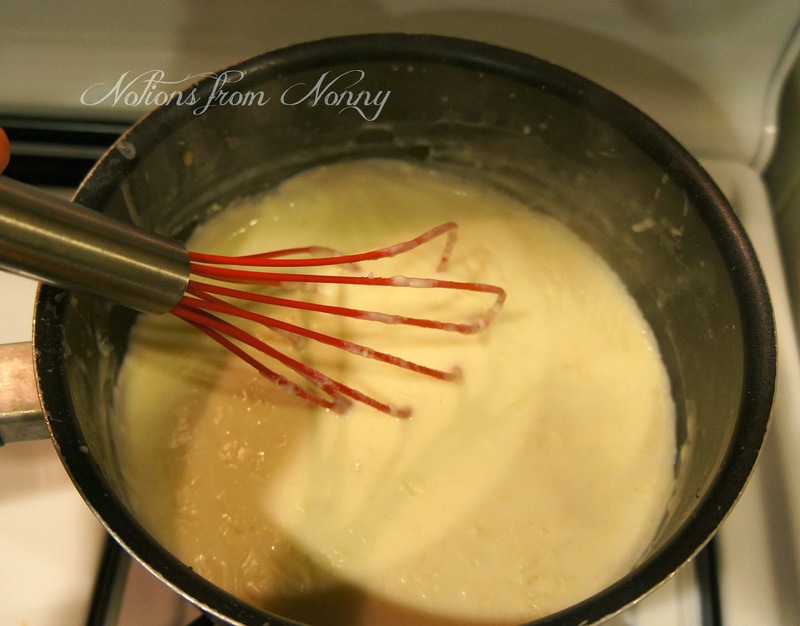 Whisk in milk and continue cooking until it starts to thicken. Remove from heat and stir in the cheese until incorporated. 5. To assemble, place the bun on the bottom. 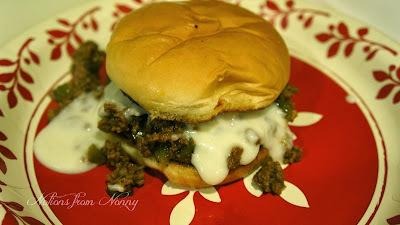 Spoon the meat mixture on top and pour the cheese mixture on top topping with the bun. Enjoy! --I wasn't completely sold on the provolone cheese mixture. Next time I am going to try provolone sliced cheese without making it into a gravy, or even another type of cheese. But other than that, the whole family thought it was a great change. 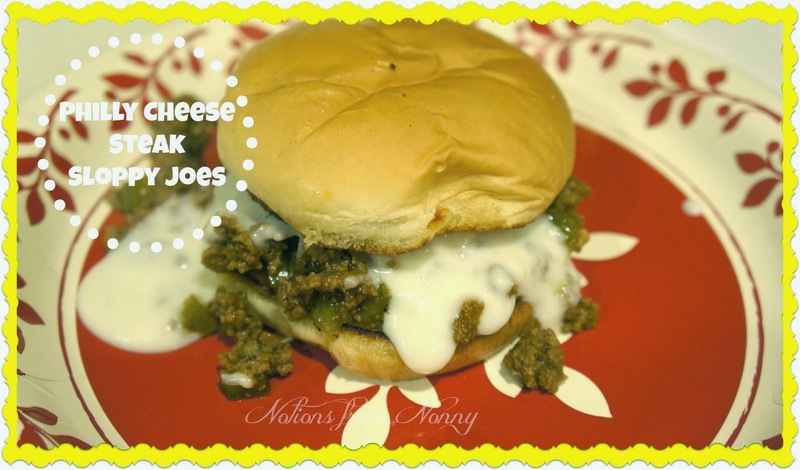 We love Sloppy Joes around here, I need to try this!! I love them and Philly Cheese Sticks but my hubby doesn't. I only get to eat them when we have them at church on youth night. Hey I could try this recipe one of those nights! Great twist on an old fave! This looks so yummy! My husband travels to Philadelphia a lot and he is always talking about the Philly cheese sandwiches. What a fun dinner idea. Thanks for sharing. My mouth was just watering looking at the photo. Thanks for sharing your wonderful recipe. Now I'm hungry!!!! Thanks for sharing @ Submarine Sunday!